What's wrong with Colorado Springs? 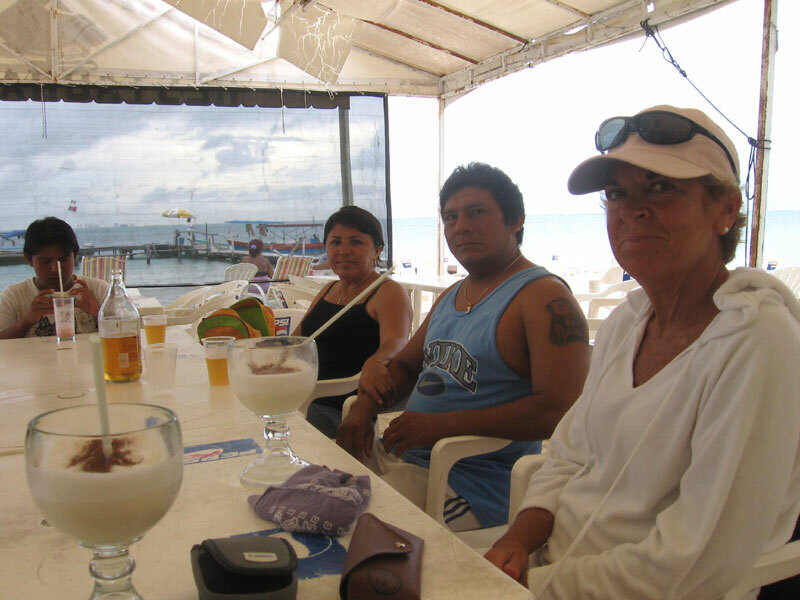 Nan and I arrived home on Monday night from our vacation in Isla Mujeres, Mexico. We cut our two-week trip short by five days due to work concerns and lousy weather. The remnants of hurricane Karl were still causing rain when we arrived, transitioning seamlessly into hurricane Matthew's near miss, with its own downpours and high winds. When it wasn't raining, the heat, humidity and sand gnats drove me mostly indoors to sit in our air-conditioned Color de Verano penthouse apartment reading Jonathan Franzen's new novel, Freedom, a topical, enjoyable page turner. 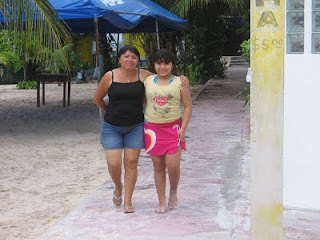 Nan toughed it out without me, getting as much "beach time" as possible. Every time we go to Isla Mujeres, and we have been there eight times now, we spend time with the same friends, see the same sights and eat at the same restaurants, but we always make an effort to explore new areas and try new restaurants. This time, we even went on a "parade of homes" tour with a real estate broker named Rogelio and our Spanish instructor, Juan Torres. There are still oceanfront and lagoonfront lots for sale on the island, but they are ridiculously expensive for foreigners and would require an inordinate amount of work to build on, not to mention extensive communication in Spanish. We tried three new restaurants: Chuuk Kay, a new Mayan-themed place located on the Laguna Macax channel and managed by our friend Ventura, whom we know from his days at Na Balam's Zazil-Ha bar and restaurant and from Brisas Grill; Rooster, a new, upscale place at the north end of Avenida Hidalgo that features wonderful creations by chef Sergio but unfortunately does not take credit cards; and Mango Cafe, an excellent breakfast and lunch place that is usually closed by the time we drive our rented golf cart past its location on the Caribbean side's main drag, but which we were lucky to find open one afternoon for jerked chicken tacos, grilled chicken empanadas and ginger lemonade. The Sunday before we returned home on Monday was our best day, even though it had its share of rain. 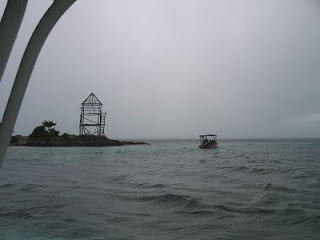 But we were out on our friend Ariel's panga for some snorkeling, so we expected to get wet. We had run into Ariel on our first night, working as a waiter at a new restaurant on Hidalgo, and agreed to do a boat trip with him. I asked if we could invite our good friend Juan Gomez's family to join us, and Ariel agreed enthusiastically. September ("septi-hambre") is always a very slow month for business, and Ariel told us he had not had a paying boat trip in more than a month. If you're down that way, please call (011-521-998-165-6332 from the US) or email (arielsantizo@yahoo.com.mx) him for a boat trip of your own. Ariel, his wife Rosi and her son Chris met Nan and me with the panga on the beach across from our apartment. 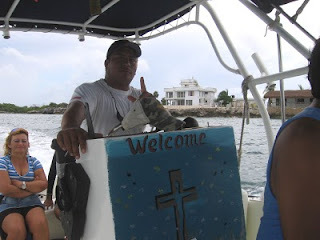 When Juan showed up with his wife Paula, kids Manolo and Paulina, and nephews Paul and Daniel, we all piled into the boat and headed over toward El Ferito, the little lighthouse that marks the entrance to Isla Mujeres's large bay. 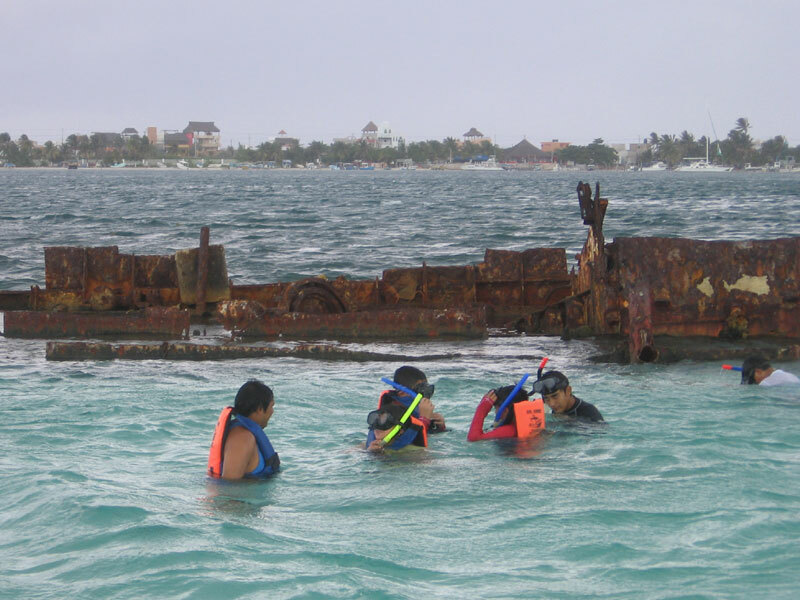 There is a partially submerged wreck there, a casualty of hurricane Wilma back in 2005, that is a natural haven for sealife. 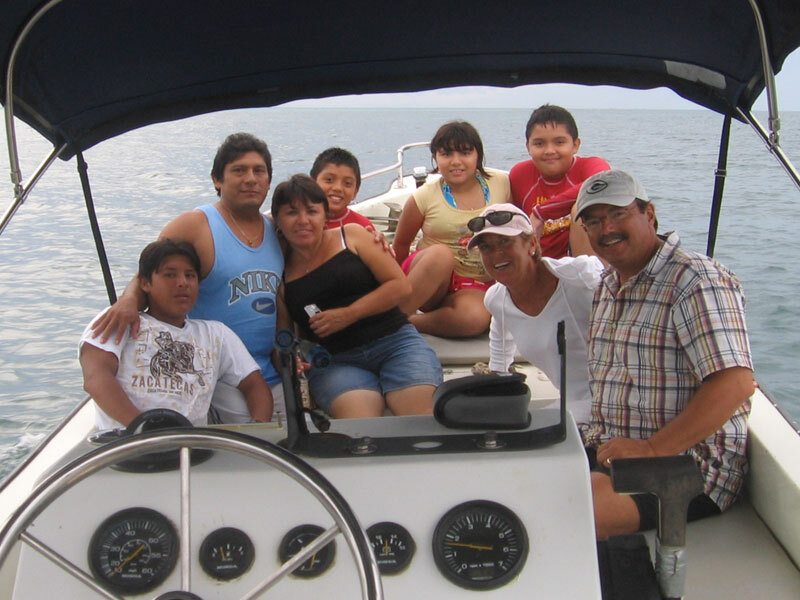 Juan and the kids put on lifevests and snorkel equipment before jumping overboard to see what they could see. A dark passing cloud soaked everybody left on board. Already wet, I jumped in too, but all I saw in the churned up water was a school of needle fish. When everybody was back on board, we headed east for a slow circle around Laguna Macax, admiring the many yachts that are moored in its protective waters. Juan and his family could just see the top of their house in the Lol-Beh colonia over the mangrove treetops. The kids were intrigued by the inhabited "plastic bottle island" that floats on the opposite side of the lagoon. We departed through the channel and passed by Sac Bajo, where "the white house," another casualty of hurricane Wilma, sits abandoned except for its caretaker unit. From there, it was a short trip down the western coast to Playa Tiburon, where Ariel had arranged for "tic-n-xic" barbecued grouper, with rice, pasta, salad and tortillas supplied by Rosi and Chris. Delicious! I was walking back from dumping lawn clippings into the dumpster yesterday when my neighbors Rich, Diane and Mim pulled up in Rich's truck with Kola, Rich and Diane's schnauzer. 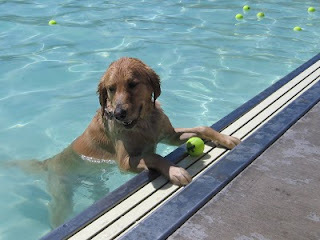 They said they were on their way to Dog Days at the city swimming pool and that Scout and I should join them. 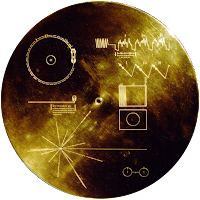 If I paid more attention to our local news, I would have known about the event, which I have attended several times in the past with both Charlie and Scout. I finished up the yardwork, put Scout in the car and drove over to Lincoln Park. Even though the event had been going on for two hours by that time, there were still plenty of wet dogs and damp owners in attendance. It took me a few minutes to locate my neighbors at the kiddie pool, encouraging Kola to swim after the tennis balls floating on the surface. I pointed at a ball for Scout to go after, but he just stood at the edge looking at it, so I gave him a nudge. After that, he belly-flopped off the edge after balls until he wore himself out. 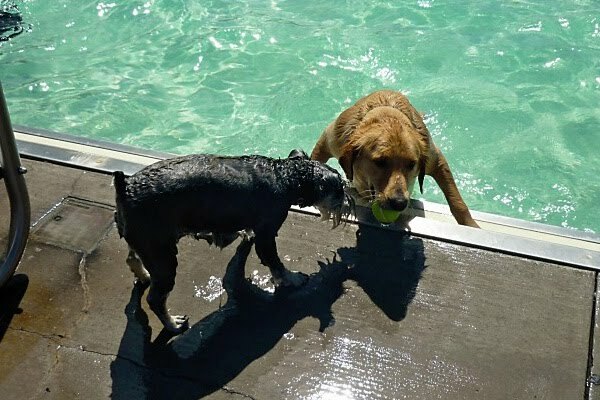 When they weren't swimming, Scout and Kola played keep-away with the other dogs, even though there were more than enough balls to go around. After an hour, the dogs had had enough. 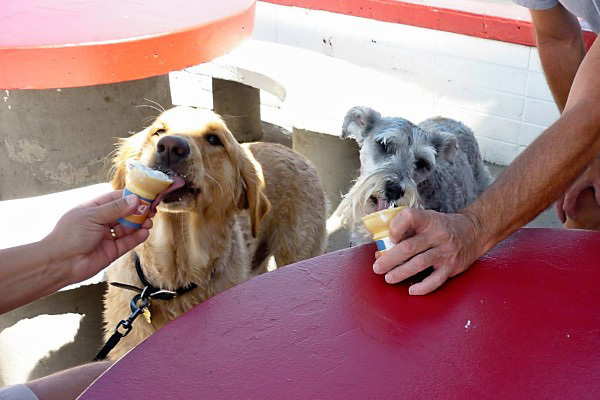 Rich suggested that we go to Dairy Queen to get Blizzards for the adults and kiddie ice cream cones for the dogs. Scout had never had more than a taste of ice cream, so I thought, why not. Scout finished his cone in about two minutes, so quickly that I wondered if dogs get "ice cream headaches" the way people do. Apparently not, because when he was done, he wanted some of Kola's, too. Last week, I listened to a segment of "Colorado Matters" on Colorado Public Radio that featured the budget director from Colorado Springs. She said that tax revenues were so low that the city couldn't afford to maintain its parks or turn on its streetlights at night. This wasn't due to the current sad state of the economy; it was due to tax cuts approved by voters. To keep things from going completely to hell, volunteers have been stepping in to cut the grass in the parks, and some neighborhoods have paid to have their streetlights turned back on. According to the budget director, this was a point of pride for many citizens, that they were actively engaged in keeping their community running. My immediate reaction was, "Are you freakin' kidding me?! This is not a community! This is every man for himself!" The whole idea behind taxes is that we're all paying our fair share to support the services that benefit all of us, that make us a community instead of a bunch of selfish, small-minded individuals. Extrapolating to the nation as a whole, this is what makes me so angry about the Tea Party, where Tea stands for "taxed enough already." I happen to think that income taxes are a reasonable price to pay for living in a free society, even though I take very little advantage of the services those taxes support. To think otherwise is to believe that you and your kind deserve some kind of special deal, maybe because you think you're working harder than the slackers who are milking the system. The truth is that, with few exceptions, people are doing the best they can. The sooner you understand this, the sooner you will realize that we are all in this life together. There are no winners, no losers. We all die in the end. Wouldn't you rather reach the end of your life knowing that you contributed what was needed to help your fellow man and support your community? I have owned an AMF Alcort Minifish sailboat since one was given to me as a present from my family for my eleventh birthday in 1969. My father and I taught ourselves to sail the little boat and enjoyed cruising it around the Chain of Lakes in Waupaca, Wisconsin over the next several summer vacations. When I was old enough to drive, I would take the boat out to the lakes west of Milwaukee, where I grew up, and sail it with friends. 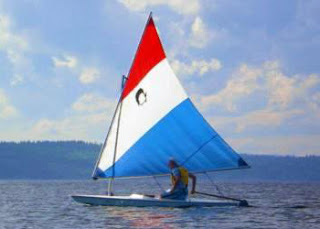 I even took it with me to college in Madison, sailing on Lake Mendota after classes. When I moved to Aspen, Colorado in 1986, there wasn't room in the U-Haul trailer for the boat, so I drove it out the following year. Nan and I would sail it every summer on Ruedi Reservoir, about an hour from home. Now we live in Grand Junction, and there really aren't any good places nearby to sail. There's Highline Lake to the north and Ridgway Reservoir to the south, but they're both so overrun with powerboats most of the time that we haven't even bothered. So the boat has been sitting unused in the garage for more than five years. When I was back in Milwaukee visiting family in July, my sister Jane mentioned the boat. She and her family live in Seattle near Green Lake, and they also have a vacation home on Whidbey Island in Puget Sound. Her sons, Max and Ben, are developing an interest in sailing from lessons they have been taking on Green Lake, and she was wondering what I was doing with the old Minifish. I explained that we weren't really sailing it anymore and asked if she would like to have it for the boys to sail. She said yes, and we emailed back and forth about it again this past week, so next spring the Minifish is going to get shipped up to Seattle. I need to do a little work on it first: the plastic rings that attach the sail to the mast and boom are missing or cracked and need to be replaced; one of the mast's endcaps got dinged when the mast and boom fell off the trailer the last time we used the boat; and the current nylon halyard needs to be replaced with a better, non-stretching one. None of these repairs is too major, but I want to hand off the boat in good condition. Ideally, I would like to fly up there and introduce Max and Ben to the boat after it arrives to give them the benefit of my forty-one years of personal experience in rigging, launching and sailing it. I'll let you know how it goes.